Mary Beth: This will be my last bee update from Block Island for a while because Ray and I are on the road. Durango, here we come!. Monday, May 3: The apple trees are blooming on the Island. The buds started opening up around April 27th, which is really early. As I mentioned in an earlier post, this season everything seems to be about 3 weeks or more ahead of schedule. I’ve had a nagging feeling that the nectar flow would be early this year. I also have a feeling it’s going to be a strong one. Last year it rained a lot and my girls were cooped up for so long during the bloom that they missed most of the early nectar. 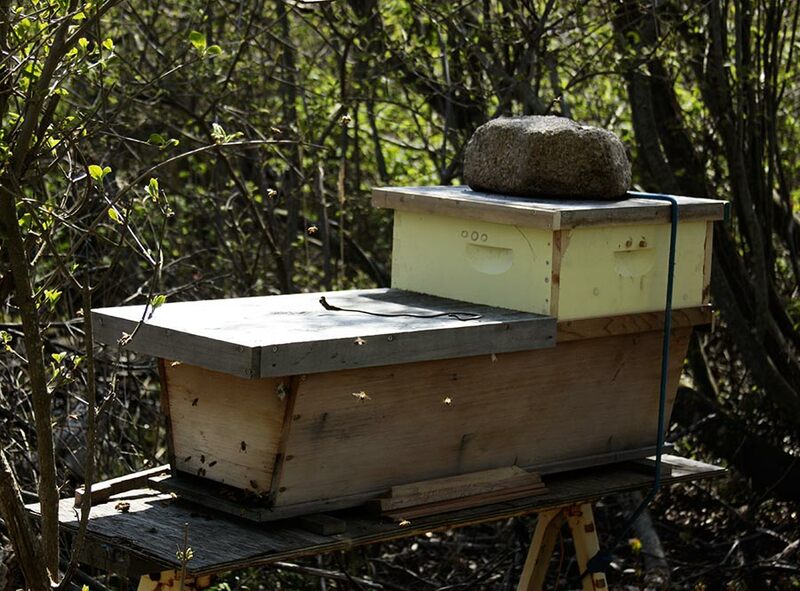 This year our weather’s been great and the bees may actually get to the apple blossoms. 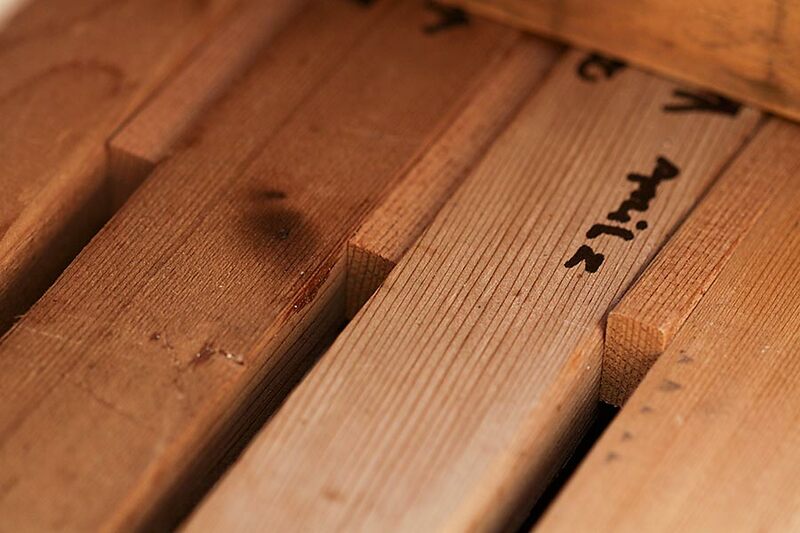 I cut a Langstroth hive box down to fit on top of the Top Bar Hive — kind of like a bee penthouse. I made two small ventilation holes for when the weather warms up. Then I cut off part of the cover of the TBH so the super could sit on top of the bars and made an inner cover, a new top and spacers for the TBH. 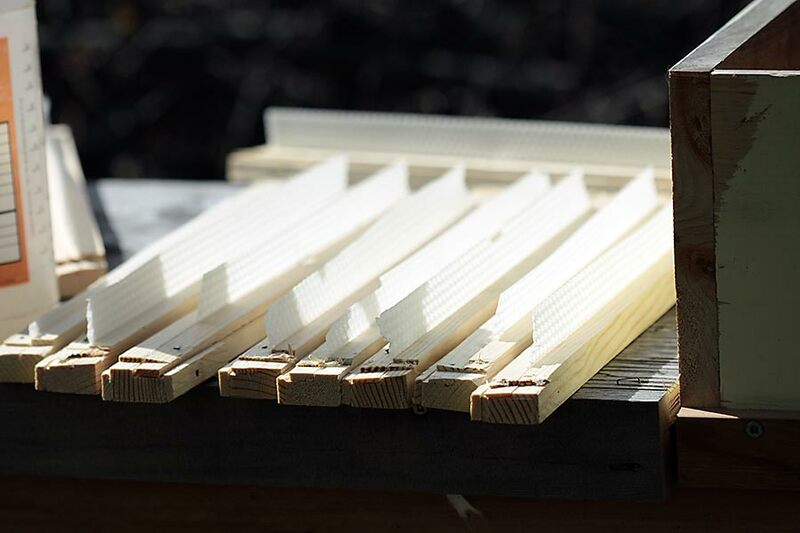 Next I cut some of the Langstroth frames to make bars with starters strips of wax and nailed on spacers. It went pretty well except for dropping a few spacers into the hive which I did not remove because the girls were in good mood and I didn’t want to stick my hand in and piss them off. Then I put the super on, snugged it up to the newly-cut edge of the old cover and viola! 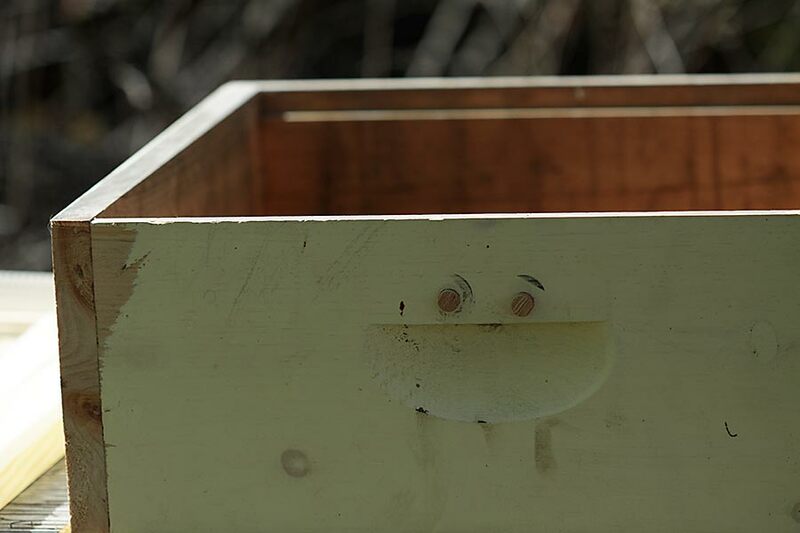 What I’m hoping will happen is that the bees will begin to create comb in the super and store their honey in that. That should give them enough room so they won’t feel the need to swarm. While I was looking through the observation panel on the TBH, I saw the weirdest thing. I saw the queen, twice. It’s weird because in all the many (many!) times I opened the panel to peer into the hive, I’ve never seen her. A couple of thoughts ran through my paranoid mind. Are they running her around because they are preparing her to swarm? (Bees will run the queen to make her lose weight in preparation for the swarm flight.) Or, did she run out of room to lay more eggs? Neither of those options is good so let’s just hope I was lucky enough to see the queen before I left and leave it at that. One bit of good news is I haven’t spotted any more mites, although I have noticed more dead bees than usual. It’s hard to say what any of this means. 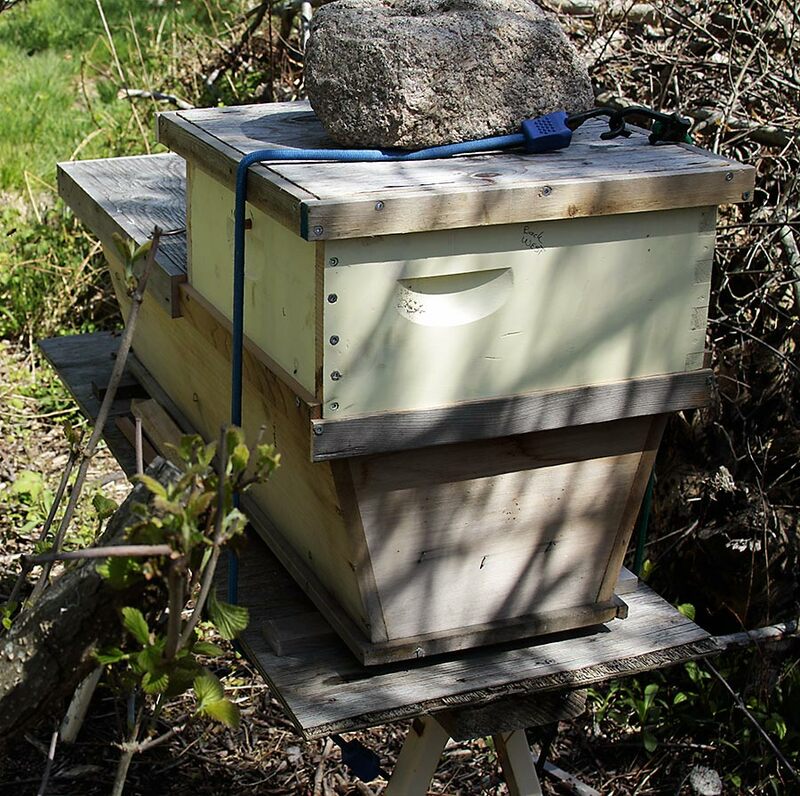 I’ve done everything I can think of to prepare the hive, so I’ll just have to wait it out and get the occasional report from my beesitter. I’ll try to send updates from the road. I’m so excited to get back to my garden in Durango and by the time I’ve traveled across the country I’ll have redone it at least three or four times! So interesting about adding the super …in the midst of packing for a cross country trip too. Wow, so adventurous! Your fit looks perfect and I’m glad to see you’ve provided some ventilation. 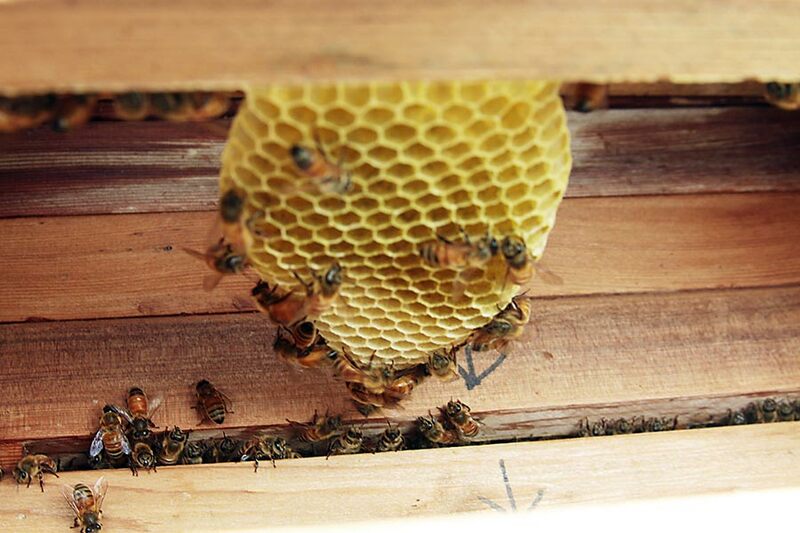 This arrangement turned into a two-queen hive for us last year, one that produce just tons of honey. Thanks Chantal, glad you stopped by! Very creative! Hope the girls fare well while you are away. It will be interesting to read a follow up.